While maternal Zika infection is strongly suspected by many researchers to be a cause of severe congenital brain defects - including microcephaly - in newborns in Brazil, a causal link remains unproven. Proving causality involves difficult, multifaceted, and time consuming research, and won't be answered overnight. But one of the major steps would be finding a plausible mechanism of infection that would produce the kind of congenital defects we are seeing (including brain and ocular defects). According to the authors of a study published today in Cell Stem Cell, they may have found just such a mechanism; one that involves a protein called AXL which resides on the surface of developing brain stem cells during the 2nd trimester. AXL is also present in retinal progenitor cells, which could help explain some of the ocular defects that have been reported. While the pieces seem to fit, this is far from a smoking gun, a lot more research is needed. I've some excerpts from the journal's press release, and a link to the study, which you can read in its entirety. Zika's hypothesized attraction to human neural stem cells may come from its ability to hijack a protein found on the surface of these cells, using it as an entryway to infection. 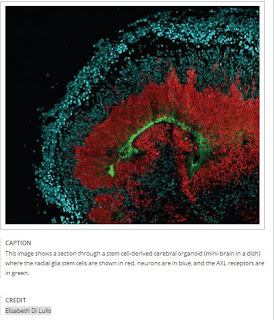 In Cell Stem Cell on March 30, researchers at the University of California, San Francisco show that the AXL surface receptor, normally involved in cell division, is highly abundant on the surface of neural stem cells, but not on neurons in the developing brain. The neural stem cells that express AXL are only present during the second trimester of pregnancy. These cells, called radial glial cells, give rise to the variety of cell types (e.g., neurons and astrocytes) that help build the cerebral cortex. The researchers also found AXL expressed by the stem cells of the retina. Disruption of this range of cell types is consistent with the multiple symptoms associated with Zika infection in the developing fetus--including microcephaly, a brain lacking in folds, and eye lesions. "While by no means a full explanation, we believe that the expression of AXL by these cell types is an important clue for how the Zika virus is able to produce such devastating cases of microcephaly, and it fits very nicely with the evidence that's available," says senior study author Arnold Kriegstein, director of the Eli and Edythe Broad Center of Regeneration Medicine and Stem Cell Research. "AXL isn't the only receptor that's been linked with Zika infection, so next we need to move from 'guilt by association' and demonstrate that blocking this specific receptor can prevent infection."